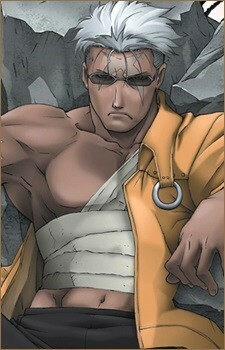 an alchemist, Solf J. Kimblee, killed his brother, blew off Scar's arm, and gave him the "X" scar on his forehead. Scar's brother then transmuted his own arm onto Scar's shoulder, giving the maimed warrior priest the powers of alchemic deconstruction that he then uses in his quest for vengeance. Scar seeks his revenge against the state alchemists, all of whom he blames for the destruction of Ishbal. His wrath does not extend, however, to non-state alchemists, which is why he does not seek to kill Alphonse Elric during their frequent confrontations.